Charles Jackson Allen, 84, of Americus died Wednesday, April 03, 2019 at his home. A native of Newton County, he was born October 2, 1934 to the late Ernest Allen and Grace Harcrow Allen Bennett. 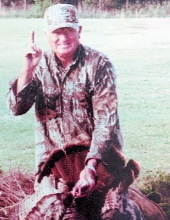 He was the Plant Manager of Cooper Lighting for many years and was an avid hunter and fisherman. Graveside services will be held at 11:00 a.m. Friday, April 5, 2019 at Sunset Memorial Gardens with Bro. Rhys Key officiating. The family will receive friends from 6:00 p.m. to 8:00 p.m., Thursday, April 4, 2019 at Greg Hancock Funeral Chapel in Americus. At other times the family may be contacted at the home of Cathy Allen, 317 Shirley Rd., Americus. Survivors include his wife, Cathy Allen of Americus; three daughters and two sons-in-law: Linda and Willie Barwick of Ellaville, Susan and Steve Lashley of Americus, and Brooke Allen and D.J. Galligan of Americus; son and daughter-in-law, Mike and Heather Johnson of Albany; and a brother, Tony Burnett of Jackson. He also leaves behind ten grandchildren and seven great-grandchildren. In addition to his parents, he was preceded in death by a son, Phillip Olsen; a sister, Shirley Paul; and two brothers, Alfred Allen and Doug Burnett. The family suggests memorial contributions be made to Phoebe-Sumter Hospice, 126 Ga Hwy 280 W, Americus, GA 31719. To send flowers or a remembrance gift to the family of Charles Jackson Allen, please visit our Tribute Store. "Email Address" would like to share the life celebration of Charles Jackson Allen. Click on the "link" to go to share a favorite memory or leave a condolence message for the family.